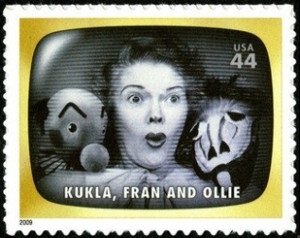 Kukla, Fran and Ollie is an early American television show using puppets, originally created for children but soon watched by more adults than children. It did not have a script and was entirely ad-libbed. It first aired from 1947 to 1957. Fran was Fran Allison, a radio comedienne and singer who was usually the only human to appear on screen, filling the role of big sister and cheery voice of reason as the puppets engaged each other concerning their foibles. The design style of puppets was in the style of Neapolitan puppet shows, or Punch and Judy without the slapstick, but their personalities were less caricatured. The puppet cast included Kukla, the earnest leader of the troupe; Ollie, or Oliver J. Dragon, a roguish one-toothed dragon (who would slam his flat chin on the stage in frustration or roll on his back to be endearing); Madame Ooglepuss, a retired opera diva; Buelah Witch, a liberated witch; Fletcher Rabbit, the troupe's mailman and resident fussbudget; Cecil Bill, the troupe's union stagehand who spoke in "tooie talk"; Colonel Crackie, a Southern gentleman; Dolores Dragon, Ollie's younger cousin, and a number of others. The series' music was written and performed by Jack Fascinato, who first accompanied the troupe on solo piano, and later conducted the show's small orchestra. Like Jack Benny's radio program, KFO's humor relied on building a relationship between its characters and the audience over time. The humor was quite tame by the standards of later comedy. There were few laugh-out-loud jokes per show—KFO relied on the humor of familiarity, much like The Honeymooners. KFO evoked not only loyalty but also a deep belief in its characters from regular viewers. Fans became so attached to the show that when it was cut back to 15 minutes in November 1951, letters of outrage poured in to NBC and The New York Times. The Bob & Ray Show was the replacement 15-minute program and had considerable vitriol heaped on it by angry KFO viewers. From August 1952 to June 1954, KFO ran as a weekly program on Sundays from 3–3:30 p.m. CT. They also began a weekday radio show in October of that year. It was then picked up by the ABC network and returned to the 15-minute daily format [7-7:15 p.m. ET] until the last regular program aired on August 30, 1957, a continuous run of nearly ten years. During that time, KFO was a hugely successful show that counted Orson Welles, John Steinbeck, Tallulah Bankhead, Ben Grauer, Milton Caniff, and Adlai Stevenson among its many adult fans. The show had sponsors like Life magazine, RCA, Nabisco and Ford Motor Co., who surely weren't trying to reach children. James Thurber once wrote that Tillstrom was "helping to save the sanity of the nation and to improve, if not even to invent, the quality of television.